The way Roman women dressed changed with time. Initially very simple and similar to that of Roman men, by the late republic women had their own distinctive type of dress, with marital and social status demonstrated by clothes, hair and accessories. 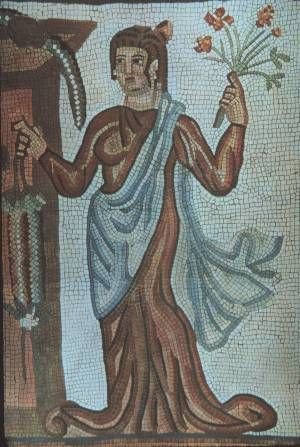 Initially, most Roman women of all social classes wore the same styles of clothing. Only marital status was obvious from a woman’s dress. With time, the increased availability of luxurious fabrics and new fashions in hair and jewellery meant that it became possible to distinguish more clearly between women of different classes. In the early republic, clothing for women was simple and indistinguishable from that of men. Both sexes initially wore plain woollen togas. This changed by the middle of the republic when distinctions in the clothing became clearer. The toga became an almost exclusively male garment. The only women who were allowed to wear it were prostitutes who had to wear rough woollen togas in public to advertise their trade. Like men, roman women wore a loincloth type garment, the subligar. They also often wore a type of bra called a strophium or mamillare which was a strip of cloth that supported the breasts. This formed the basis of roman female dress. It was a long tunic onto which other garments could be added. The tunica was composed of two rectangular pieces of cloth with the top section open. The garment was then pinned down the shoulders and arms and belted at the waist. Chiton style. Similar to a Greek chiton, the sides of this garment were sewn almost to the top were it was fastened along the arms and shoulders by a series of brooches or pins. Sleeves could be long or short according to the width of the cloth. The style could be varied by belting it under the breasts, around the waist or on the hips. Peplos style. This was a sleeveless garment. Again, the sides were sewn and an opening left at the top that needed to be pinned closed. The difference was the top was folded down at the back and front to create a drape of cloth. The garment was then fastened at each shoulder with a brooch. A short over tunic could be placed over the , or it could be worn on its own or accompanied by the and . The Stola and the Palla. The stola and palla were strictly traditional female garments. The Stola. A long, sleeveless tunic, the stola was worn suspended from the shoulders by straps. It was the garment of the roman matron. Although it was required that all married women wear it, by the late republic many women flouted the law as more flattering styles of dress became popular. The Palla. The palla was a shawl worn over the tunica and stola. Its precursor in the republic was a simple square cloak called a ricinium. The palla was a more elegant garment that fell from the left shoulder and draped under the right arm. The badge of the respectable woman, its back fold could be used by matrons or vestal virgins to cover their heads. Status was conveyed most clearly in material of clothes as well as the accessories and hairstyles worn by women. Women’s clothing was originally made from simple fabrics such as undyed wools or linens. With the rise of the Roman Empire, materials for garments became more decadent, for the wealthy and upper classes at least. The traditional materials were supplemented by brightly coloured silks. A particular display of status was to have a wide ornamental hem on a tunic or stola, called the instita. Female clothing became so ostentatious in the late republic that anti opulence laws were passed. They were repealed after the women took to the streets to protest. Hairstyles were initially simple in the republic and early empire, consisting of a chignon or rolled plaits. Roman empresses began to dictate fashions for more elaborate hairstyles consisting of curls and waves. Such styles could only be achieved with the help of a personal hairdresser, meaning they were the preserve of the rich. These hairstyles were accessorised with elaborate jewelled hairpins and hairnets of gold or silver. Wigs and hairpieces were also common. The fibula was the standard clothes fastening. Shaped rather like a large safety pin, it could be of plain, cheap metal or else of gold and silver. High status Roman women accessorised with fastenings made of precious metals or adorned with jewelled cameos. Gibbon’s (abridged and illustrated 1979). Decline and Fall of the Roman Empire.Bison Books.